A couple of days ago I delivered a speech during the inauguration ceremonies of the Alexandrian Innovation Zone, in Thessaloniki, Greece. This zone is supposed to become the beginning of a Silicon Valley-like area in Greece and provide a venue for economic growth in the country. I thought that it would be worthwhile to post a few excerpts from the speech, particularly in order to elicit feedback on the immediate steps I proposed for Greece to take to increase the probability of this initiative’s success. Greece recognizes that entrepreneurship-driven innovation is a major driver in modern economies. The importance of innovation-driven economies and the emulation of Silicon Valley’s successful model in creating such economies have been recognized as early as the 80s by Israel (see here for an overview) but later on by several other countries, and most recently by Russia, Saudi Arabia, and Jordan. All these countries are trying to learn from Silicon Valley’s successes and failures, identify their regional advantages, and then adapt Silicon Valley’s model to enhance these advantages. First, it is important to stress that Silicon Valley was created over a period of 50 years. So any such initiative must be given the time to flourish and must become a national goal. Second, one should be careful to properly adapt the Silicon Valley’s model to the region’s characteristics. 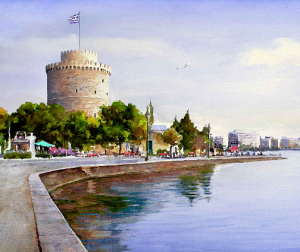 By drawing lessons from Silicon Valley and other similar efforts and tailoring them appropriately to Greece’s innovation model and Thessaloniki’s regional characteristics, Greece can make the Alexandrian Innovation Zone succeed and broaden its impact to its constituents and beyond. I would like to now propose a few make easy steps that Greece will need to consider taking around the Alexandrian Innovation Zone. Initially I propose that Greece applies these steps around only to the high-tech sector. The goal would be to create some quick successes that can be used as a springboard for additional more fundamental and broader changes. 1. Make easy and inexpensive the creation, financing and dissolution of high tech companies. Starting up a business and getting the proper regulatory permits should be quick, and inexpensive; not rocket science. Look at the examples of countries like Singapore where it is possible for a company to be established and funded within weeks. Moreover make easy for small companies to obtain lines of credit from local or foreign banks so that they will have appropriate working capital. Offer incentives to the banks to provide such loans. Look at banks like the Silicon Valley Bank that specialize in this area. 2. Teach entrepreneurs that from the beginning of their venture they must consider the world markets for their products rather than the Greek market alone and make that easy. We all understand that the Greek market is small. In this respect it is not dissimilar from the Irish, Israeli and Singaporean markets. In these countries new companies learn to develop products with global appeal and start marketing them internationally very early on in the product development cycle. 3. Make it easy to captivate the local talent as well as attract the best people possible from around the world for the technology sectors being pursued and the companies being formed. Understand that Silicon Valley is not about the people who live here, it’s about the people who are attracted here. China, and India but also Singapore and Saudi Arabia are doing exactly that. It is not important to only have the right technology innovators but you need to staff companies with people from other disciplines to make them successful. Product managers who shape the product to address the market’s needs, engineering executives who lead the teams that transform an innovative technology to a product the market can use, sales and marketing executives who propel the product to the international markets, and CEOs that lead the companies to great outcomes must be part of any such effort. 4. Establish intellectual-property offices in the country’s main universities and make easy and fast the spinning out of research from universities and national labs. Negotiation of IP rights and licensing of patents should be done in weeks not months or years. Make easy for professors and students to leave the university to start a company and then return back to the university. The constant flow between academia and industry has been rejuvenating for many academics in the US, Israel, India, Brazil and Singapore. 5. Make easy the importation and exportation of foreign capital. Learn from Israel, India, China and Russia, on how their governments continue to work with American venture capital firms to establish ways to start new investment funds in these countries and jump start their innovation-driven economies. 6. Make it easy for high tech startups to operate by offering to lower their taxes, and collect these taxes only after the startup’s losses are recouped and offer an additional tax-free period of a few years during which the company is profitable. 7. Make easy the provisioning of infrastructure, from signing office space leases, to getting various permits, telephone lines and broadband internet. Learn from best practices in Singapore, and Silicon Valley. These are some of the short-term steps that you should consider. These are some of the short-term steps that you should consider. For the medium term you should consider providing a more growth-friendly corporate tax environment, as well as other incentives that will cause particularly large foreign high tech companies to come and establish technology operations in Greece, and making easy for entrepreneurs of failed companies to start new ventures. Longer term you will need to work on providing a transparent financing environment, an area we are now advising Russia on, creating special incentives to attract larger pools of risk capital and making corporate M&A easy. You will know that your initial steps are having the right impact when the pace of high tech company creation increases, the products of the financed companies start to attract the attention of the international markets, and capital begins to flow into Greece to be invested in these companies. This will be a multi year, national, and difficult effort that must involve a unique partnership between government, academia, industry and people. In order to succeed, Greece will need to execute flawlessly and consistently while competing successfully at the international stage. I look forward to your comments on the above and additional suggestions for steps that will be important for countries like Greece to take in order to spur entrepreneurship-driven innovation and economic growth. Seasoned venture investor, senior advisor to global corporations, and a recognized thought leader in big data, digital platforms, and corporate innovation. Author of the book The Big Data Opportunity In Our Driverless Future. Founder and Managing Director of Synapse Partners, a firm that invests in early-stage companies developing applications that combine artificial intelligence with big data. Previously Managing Director with Trident Capital and Apax Partners. Prior to his investing and advisory work, Evangelos had more than 20 years experience in high-technology industries, in executive roles spanning operations, marketing, sales, and engineering. He was the CEO of two startups. He is a member of Caltech’s advisory board, the Advisory Board of Brandeis International School of Business, and the advisory board of Center for Urban Science and Progress. In 2014, he was named a Power Player in Digital Platforms. Evangelos earned a Ph.D. in computer science from Brandeis University and a B.S. in electrical engineering from Caltech. As a fellow expatriate Thessalonian living in Silicon Valley, I could not agree more with you. Your recommendations are correctly centered around reducing Greece’s overburdened bureaucracy that is one of the strongest impediments to the country’s growth. This is now even more relevant and the zone can serve as a blueprint for the rest of the country as it tries to overcome the financial crisis. I also concur that this is going to be a multi-year initiative and hope it will be governed with that premise in mind. This innitiative was started a few years ago from the former goverment.Untill now we haven’t seen many things.Never the less, I agree with you and I hope that in the near future will help our country’s economy to grow.